Long before earning a bachelors degree in computational and mathematical science, a masters in applied mathematics and a doctorate in mechanical engineering, he was a drama major. He worked for companies that made video post-production equipment, had a karaoke-hosting business and once helped edit a short-lived soap opera. He even did open mic stand-up comedy a few times. All of which has come in handy as he searches for ways to best engage his mechanical engineering students at Washington State University Everett. It is why he can be found some days lecturing alone in a classroom-turned-studio on the third floor of the campus off North Broadway. He is his own one-man production crew, and he takes advantage of new technology that makes it appear as if he is writing backwards on an invisible chalkboard. “I’m trying to do what is called flipping a class,” he said. Flipping a class is an instructional strategy that blends tradition with technology, a way that takes time to make time. He has recorded a series of short lectures his students watch online outside of the classroom. That allows him to give students more individual and small group attention when they’re trying to solve problems inside the classroom. In other words, he’s less the center of attention in the front of the room and more of a roving consultant around it. More class time is dedicated to applying skills than taking notes. Taub uses the flipped format in what’s called a finite element analysis class. He hopes to do the same next year with a dynamic systems course. He’s well aware that the subjects are densely technical and deep into mathematics. That’s why he makes short high-quality videos, in the neighborhood of five to 10 minutes. They’re intended to be bite-sized bits of knowledge that can be slowly digested. Students might have four or five videos to watch between twice-weekly classes. Travis Norton, a junior mechanical engineering student, has come to appreciate the format. He wouldn’t want to try to learn the material solely online, but he likes the idea of being able to go back and review the lectures. In most classes, “if you miss anything, you are kind of on your own,” he said. “With this you can watch it over and over and over again. You can watch it until you get it. “I can watch it before class and apply it during class,” he said. What makes Taub’s video lectures unusual is his students never see the back of his head. When he writes he is facing the camera. A transparent pane of glass suspended in a metal frame stands between him and the lens. On the edges are embedded LED lights that illuminate his notes and equations. Early on, some students asked him if he was writing backwards. Some assume he is left-handed. Something called a video switcher is used to flip his writing so it doesn’t appear to be backwards. When he has a big chunk of information to present, he can save the writing time by dropping in pre-prepared Power Point slides that seem to float in as illustrations and diagrams. He can write on them if need be. All the while, he can control colors, backgrounds and darkness. “The idea is to make things more interesting and engaging for students,” he said. 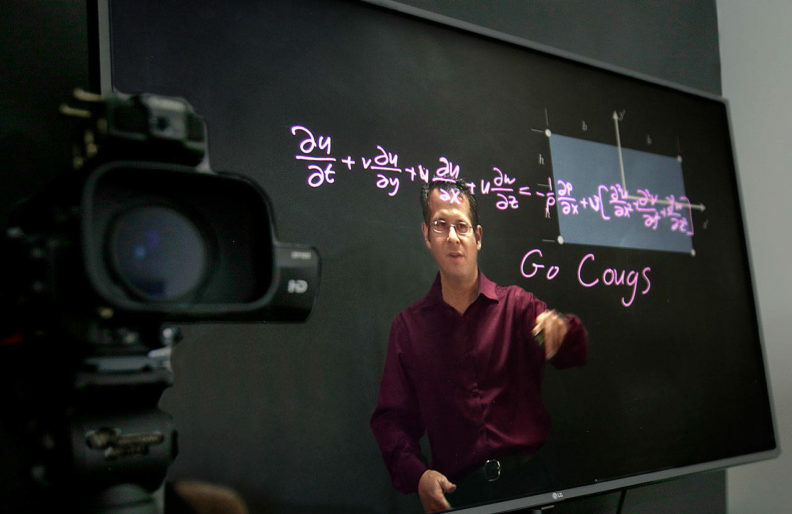 Taub is using what’s known as a Lightboard, the brainchild of Northwestern University engineering professor Michael Peshkin who figured visually stimulating videos for his students would free up class time for more valuable interaction. Taub estimates that he has spent eight hours in preparation and production for every hour of actual video. He said it has been worth it because it is allowing him to reach his goal of spending more time working with his students on the material they need to know. The reward of that extra time has justified the work.